Two years before his monstrous monstrosity Godzilla, Roland Emmerich hit the streets of Washington DC to tackle an alien invasion. Time — and a great deal more effort — would go on to prove extraterrestrial superiority over the giant lizard, though that’s not a particularly astounding declaration. Just how effective is Independence Day? If popcorn-munching and Coke Zero-slurping is your kind of thing then the global disaster flick works a treat. Don’t expect any intellectual poise for there’s hardly an ounce to be had. But that’s not a problem — you wouldn’t show up to Comic-Con looking for a Jane Eyre panel. Emmerich zaps many of the right notes here and, despite the modern datedness of a visual palette once heralded as ground breaking, Independence Day cajoles along boisterously. The unexpected arrival of alien spaceships only a few days premature of July 4th sends the United States into disarray. Major cities are under immediate threat causing the peoples within them to scatter. With less than a spoonful of hope to consume, President Thomas J. Whitmore (Bill Pullman) finds himself seeking aid from somewhat unconventional sources; specifically, ambitious pilot Steven Hiller (Will Smith) and nutty computer expert David Levinson (Jeff Goldblum). But this appreciation of and for innovation speaks to a higher purpose relayed across the exceedingly long two and a half hours. 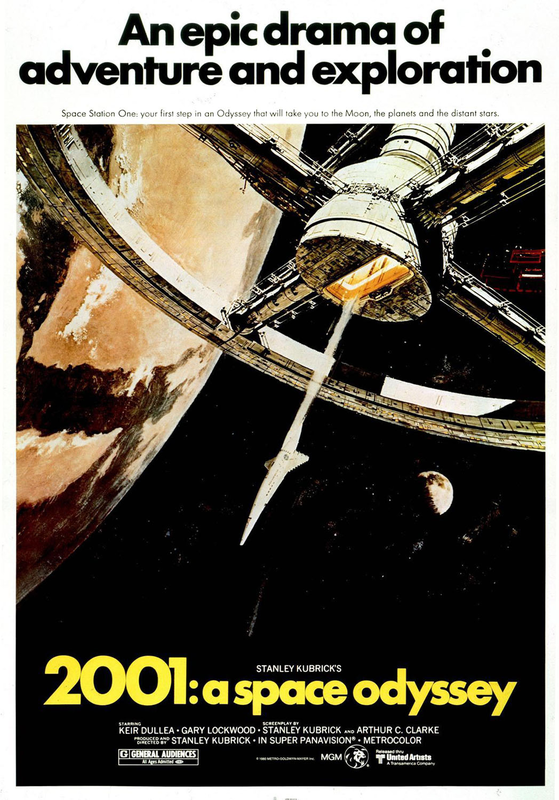 Though the implementation is fairly blasé in terms of a ponderous deficit in depth, the film does propose the age-old alien versus human musing that has captured the imagination of pop culture since Neil Armstrong and of cinema since Stanley Kubrick, more or less. 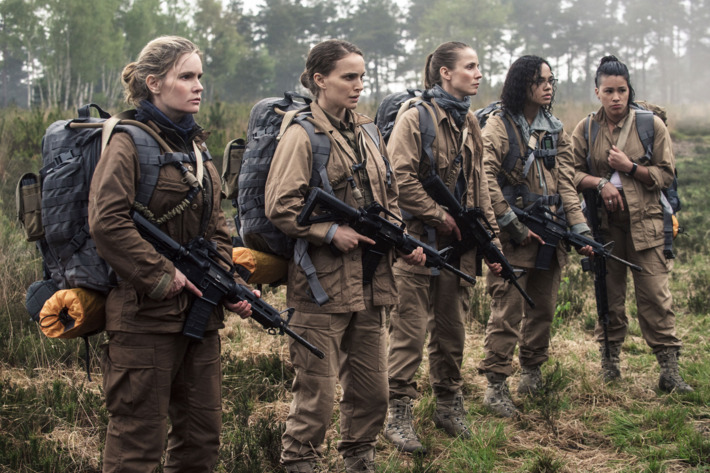 Emmerich and co-writer Dean Devlin’s script struggles to delve anywhere past the glossy surface — in truth, it can be really glossy — but the vigilant thinkers amongst us are still able to briefly consider some interesting possibilities as events roll across the screen. Initially, we’re fed a distinct juxtaposition: disparate humans manifest, from the amusing to the serious to the disbelieving, whereas the stoic extraterrestrials are collectively brooding and sophisticated. It’s not until further down the heavily destroyed road that similarities strike; aliens, though technologically adept, can be just as frail as humanity. The suggestion of familiarity is intriguing but it doesn’t receive enough focus to fully unravel. That’s because Independence Day rockets along with energy and sappy joy. Let’s be honest: the President’s Independence Day speech is amiably absurd, even more so than preceding the alien invasion. (“Perhaps it’s fate that today is the Fourth of July, and you will once again be fighting for our freedom.”) This mightn’t boast the scholarly prowess of a 2001 or even the tingling tension of an Alien, but it does come armed with fun and humour. Maybe it’s simply the childhood beer-goggles still clouding my judgement 15 years on, however it seems like the 90s was a time for chaos and frantic comedy on the silver screen. I’m thinking Space Jam. Jurassic Park. Home Alone. These films each share the same semblance of bumbling pandemonium as Independence Day, a trait that is rather infectious. Admittedly, it is true that the quartet of aforementioned films come equipped with the stock aloof goof. 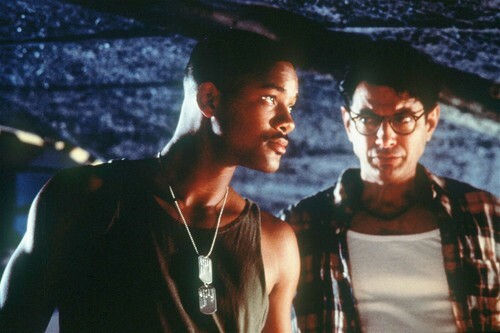 We’ve essentially got two here, though Jeff Goldblum’s David Levinson is a tad more measured than his father Julius. (“‘All you need is love’ — John Lennon, smart man… shot in the back.”) The two bounce off each other with amusing distrust yet above the familial cabin fever, they’re a healthy duo and probably the best characters. Will Smith is as charismatic as ever, it’s the lack of well-roundedness that lets him down. 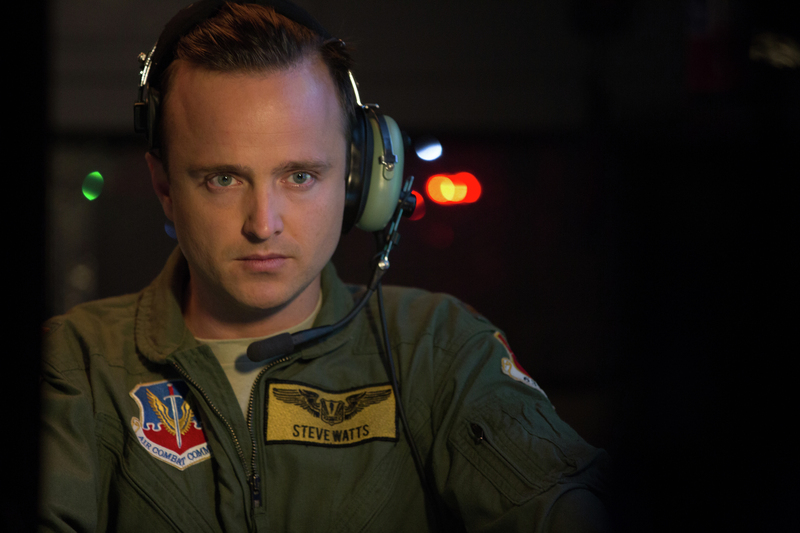 His character Steven Hiller, along with most others, suffers from genericism syndrome. At least the guys fare better than the girls, the few of whom don’t have an awful lot to do. Granted, this isn’t a spectacular examination of the human psyche or anything, it’s pure entertainment with a spectacular visual array. Unfortunately almost 20 years has passed and this once award winning ocular jigsaw has become penetrable. There are a number of clunky moments — the tunnel fireball stands out — but it’d be unfair to criticise a film for ageing. One area that ought to attract some denunciation though is the prevailing lack of threat, an element that is sorely needed in order to usher in the full effect of disaster. There’s hardly any depth to the story, nor is there any strand of worry interwoven throughout proceedings which is odd given we watch the decimation of huge cities. Personal anxiety should arise, but never really does. 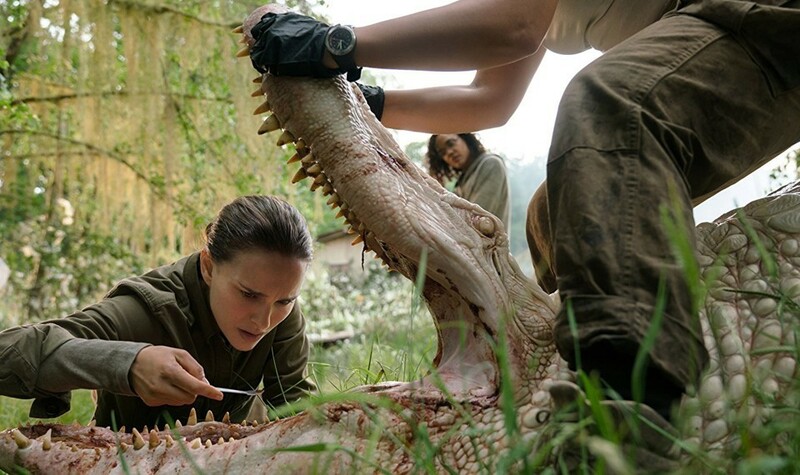 Exposing the audience to so much carnage early on sanitises the remainder of the film — we know the worst has come and gone and the characters themselves aren’t really worth investing in, thus there is no obvious agent of emotion to clutch dearly. 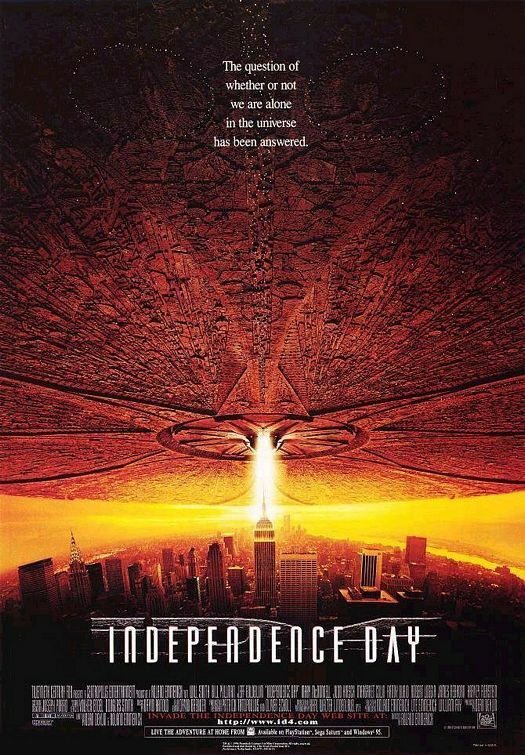 Nevertheless, that is not Independence Day’s primary prerogative. Emmerich directs a film that should command greater emotional gravitas given the velocity of proceedings, but when push comes to shove this does what it sets out to do with exuberance and laughter. In fairness, compared to Godzilla, this is Citizen Kane. Quite appropriately, Sunshine spends a significant amount of time focusing on the eyes of its pawns. Sometimes a pair will fill the entire screen, strained with sentiment either good or bad, though often the latter. On occasion, they will fight menacingly through an iffy transmission from another spacecraft and act as a warning. The Sun allures them with its fiery aesthetic and unwavering appeal. Without hesitation, characters ask, “What do you see?” in moments of impending demise as if nothing else matters in the universe. Look, even, at the poster. Yielding a blazing visual palette and dreamt up by the mind’s eye of screenwriter Alex Garland, the film is a sci-fi celebration, though you won’t see much celebrating. 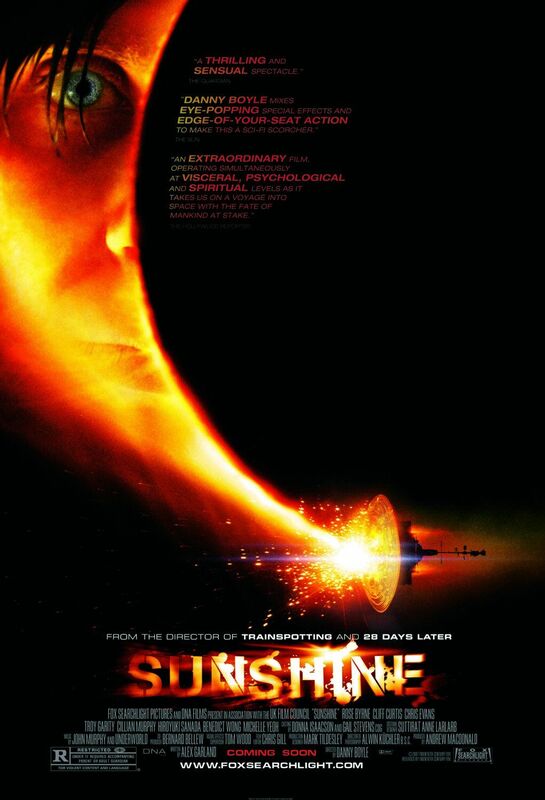 Riddled with mystery and psychological incoherence, Danny Boyle’s Sunshine floats very close to the sublime. It is 2057 and an ominous solar winter has a stranglehold on Earth. Aboard Icarus II, a team of eight personnel are voyaging to the dying Sun with one aim: to reignite it. 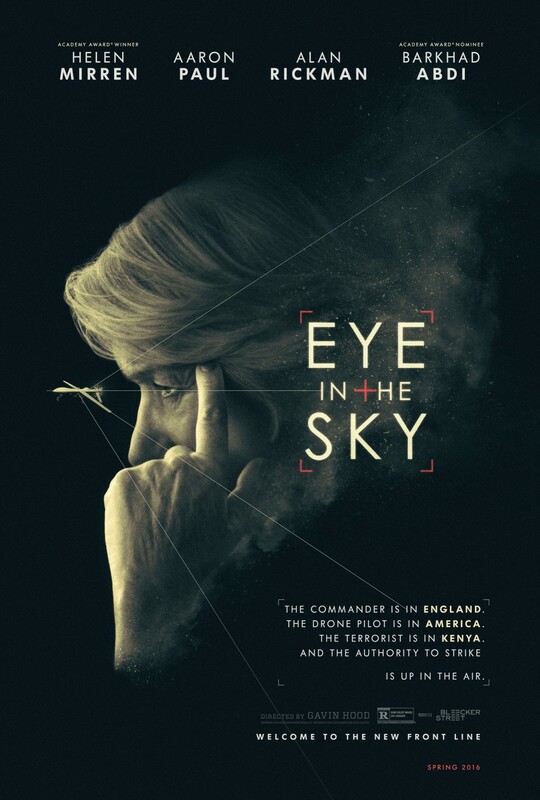 Carrying a nuclear payload, the crew only have one chance to hit their target and, given the operation’s purely theoretical prerogative, those odds aren’t as robust as the situation warrants. 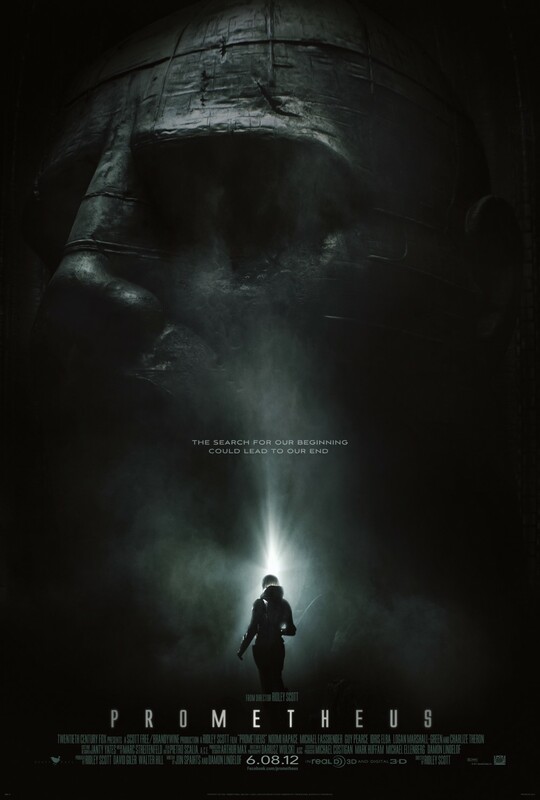 Upon discovering the location of Icarus I — a prior failed mission — physicist Capa (Cillian Murphy) recommends taking a detour in order to attain another bomb, and another attempt. Though his portfolio doesn’t suggest much science-fiction enthusiasm, Danny Boyle’s admiration for the genre fireballs from the screen here. There are elements of seminal space cinema splashed all over Sunshine. 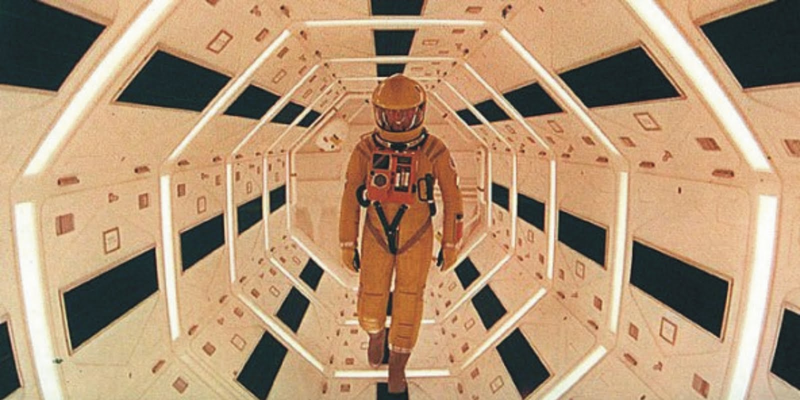 From the vision of 2001: A Space Odyssey, to the fraught psychology depicted in Solaris, to Event Horizon’s incessantly doomed outlook, Boyle’s take on sci-fi pays homage to a plethora of greats. But it does more than that. This isn’t simply a historical Pick ‘n’ Mix of stars and planets, rather it incorporates the genre’s best components with subtlety and proceeds to tell a new story. 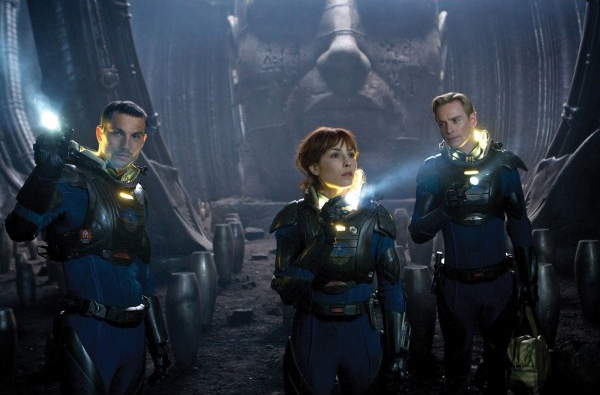 We do not witness Capa and company enter a separate desolate spacecraft and subsequently become overwhelmed by thoughts of Event Horizon because Boyle does not allow it. The Brit always has control and his film always has us transfixed, not by inter-genre nods, but by an ever-enveloping tension and disconcerting mystique — in truth, the film refrains from sparing us any time to consider references until long after the credits have rolled (I’m recounting citations right now). The director employs traits familiar to him, such as gritty realism and terminal dejection, and combines them with far more expansive notions that pit science against religion. In between philosophical conversations (“A new star born out of a dying one, I think it will be beautiful — no, I’m not scared”) crew members discuss the practicalities of their predicament: oxygen supply levels, or the Sun’s angle. Astronauts aside, we cannot relate to the quandary in which those aboard Icarus II find themselves, but we can ascribe to the pragmatic mindset that they often reverberate. The characters are normal people. Yes, they are each excessively intelligent and well-versed in specialist areas. But despite floating many miles above in space, they remain grounded — we have to take each individual at face value as none of their past lives are explained. You can forget surnames too: Cassie, Harvey and Mace will do just fine. These are ordinary people in an extraordinary circumstance, decision-making dictated by scenario and each individual just as vulnerable as any of us would be. The characters’ incomplete personal logs contribute to another of the film’s successful narrative strands: a growing sense of tension. This is not a horror film yet it bears a variety of horrifying aspects, one of which is personnel ambiguity. Since we only know that which is in front of our eyes and nothing more, it is plausible to us that any member of the team could snap at any given moment. Boyle explores isolation and the subsequent psychological trauma faced by those disconnected from civilisation, a concept captured magnanimously by one character’s reaction to the decimation of a homely, naturalistic oxygen garden. As Icarus II advances closer to its destination (“Entering the dead zone”) a haunting strain is emitted, one that is eerie and difficult to pinpoint. Searle, the vessel’s doctor, becomes increasingly transfixed by the Sun which appears to be hauling the spacecraft ever-nearer to imminent death. A slight tonal shift occurs in tandem alongside the crew’s interactions with the ill-fated Icarus I. From a tantalising slow-burner, proceedings deviate towards disorientating terror. The final act is probably the film’s weakest, but it is by no means a weak offering. If anything, the conclusion ushers in greater mythological tendencies spearheaded by religious impetus (in Greek mythology, Icarus flew too close to the Sun). Perhaps it is only fitting that a narrative adjacent to the heavens should juggle Godly morals. Nevertheless Boyle, a man with religious associations himself, ensures that Sunshine does not become overburdened by spirituality and instead strikes a wholesome balance between the film’s various thematic veins. A scorching visual gloss is as all-encompassing as it is magnificent. The dark and inherently inanimate interior of Icarus II seems to not only seep from the crew’s mellow demeanour, but also abets an air of warped uncertainty. Battling to infect the spacecraft’s overcast insides is the Sun; rays burning with unlimited effervescence, so much so that you will be rolling up those sleeves in a desperate plea for cool air. Accompanying the wonderful cinematography is John Murphy’s tender-yet-lofty score that shines brightest towards the Sunshine’s concluding chapter. Cillian Murphy leads the way as Capa, whose contemplative nature suggests that only he is truly aware of the task’s magnitude. The skill here is in generating a sense of normality and the best plaudit that can be awarded to Murphy — a generally charming presence — is that he emphatically portrays a professional physicist. Capa may partake in a few scuffles with Chris Evans’ Mace, but other than that he is plainly a physicist driven by nuclear properties and measurements. The aforementioned Chris Evans does well in a slightly different role as the morally strict engineer whose sole focus is the success of the mission. The other noteworthy performance comes from Rose Byrne as vessel pilot Cassie. Bryne develops a solid equilibrium between strong-willed and sensitive, and also strikes up a believable dynamic with Murphy, one that would undoubtedly be romantic in another environment. Capa’s opening monologue outlines one purpose: “To create a star within a star.” Boasting admirable scope, a tense and engaging atmosphere, and a variety of well-oiled thematic roots relevant to the genre, Sunshine is undoubtedly a star turn from Danny Boyle.